Attendees: Nick Pilch, Sherie Reineman, Harry Chomsky, Ken McCroskey-Wait, Amy Smolens, Preston Jordan, Sylvia Paull, Pete Maass, Jonathan Walden, Bryce Nesbitt (partial attendance). The meeting was hosted by Nick Pilch at his home in Albany and called to order at 4:10 p.m.
x 1. 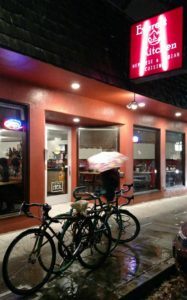 – bike bike racks – 6 racks, 3 locations, total 12 now. What’s essential to talk about? Phase I, from Pierce St. to San Pablo Ave.
x 11. 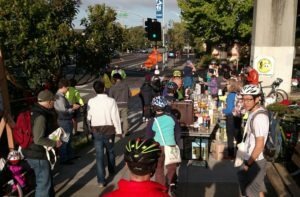 Complete Streets: Does AS&R have any positions that Harry Chomsky should advocate at the meeting on 1/28? In particular, what are our collective opinions about the various bike-lane options for San Pablo? our organization’s signature to their two current petitions. x 14. 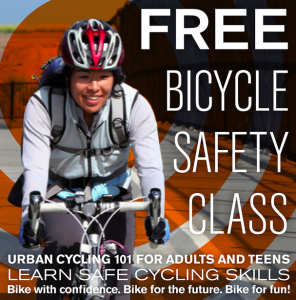 Bring your bike to help test a new bike rack style! news. How to invite more Fb followers so it can be more effective? 17. Threshold of transportation measures – 55%? – bike bike racks: 6 installed (these are in addition to the previously installed 6 bike bike racks). Locations of new Bike Bike Racks are two each at Wheels of Justice Cyclery (1554 Solano Ave) Grazzy Burgers/Albany Pub (coming soon to 745/747 San Pablo Ave) and St. Alban’s Church (1501 Washington.). Ken McCroskey designed decals for rack “saddles” that local business Design-A-Sign produced at both excellent price and quality. 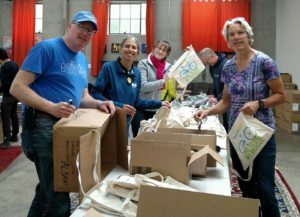 Preston volunteered to write article for Patch, get photos (Amy suggests props to Mark Matherly, the City of Albany Public Works employee who has been instrumental in bike rack installation). Ken reports that Design-A-Sign gave us great deal, good quality, appreciates AS&R’s role in service to community. Incoming checks: $900 from the city, $400 each from three rack locations. Balance after the dust settles will be around $3,000. Complete Streets: charette over. Harry reports there is a follow-up mtg in coming week (notice was just sent via email to Harry from Aleida). San Pablo: Amy reports that in the charette sessions, the participating engineers mentioned z-shaped median configuration could be solution to redesign of San Pablo including bike lanes on both sides. The z-shaped bike/pedestrian crossing includes a diagonal safe shelter in median with access/exit crosswalks off-set across traffic lanes from the ends of the diagonal. Advantages include use of 4′ median but longer safe-harbor space to accommodate bicycles/trailers, and still leave room in traffic lanes for bike lane each direction on San Pablo Ave.
west of San Pablo – construction has started (trees removed, etc). Ken reports he has already pointed out some errors in the drawings/plans (typos, misplacement of signage, etc), however the plans do seem to allow for a potential signal at Taylor to accommodate the USDA employees. 5 candidates: all seem to have good qualifications, experience. wants organizations & individuals to sign petitions. New Aluminum Bike-Valet-Parking rack (2 racks given to AS&R to try by Greg McPheeters of “Moved By Bikes,” at the suggestion of John Ciccarelli.). Cost for purchase: $80/each; one rack accommodates 6-8 bikes, has rubber feet; Ken reports we currently we have about 6 galvanized pipe racks & 1 or 2 wooden racks and could make do for Arts&Green, however, Ken recommends purchase 5 before Arts & Green. Purchase was voted upon, approved and authorized and is in keeping with our community service mission, as well as our intentions of using donated funds (i.e., from GPC, Bua Luang). Ken had brought a sample of the new/proposed bike rack (sample from manufacturer to promote trial and purchase) and had set up in Nick’s back yard, so we all got to see how it worked, set up and also ease of dismantling and storage. Design has several advantages over current racks: lightweight (aluminum), shorter storage size (about 5 ft), affordability, ease of transport. Additionally, with the purchase of these racks, AS&R could further the community service mission by loaning them out to other organizations for events. Ken will inquire to manufacturer regarding estimated life/durability of racks. Bike-to-Work-Day: Nick volunteers to take lead. has seen email for kickoff mtg (Feb.1st, 3pm), will attend; Amy may also be able to attend. EBBC has new BtWD coordinator, Dave C no longer involved in BtWD. AS&R Energizer Station: Change location back to Marin/Masonic (both sides of Ohlone Greenway now open again at Masonic), location is important for public visibility and also for service to University Village residents. Bryce Nisbett pointed out that large, simple banner “Bike to Work Day” visible to motorists on Marin Ave sends positive message about BtWD). Design-A-Sign is quick & reasonable. (Nick reports in past City has been sponsor for the AS&R Energizer Station, but historically their sponsorship has been limited to loaning 2 tables; Nick has asked City in past if sponsorship could include a banner and City declined; Nick will ask again about banner. Arts & Green, May 19th (11-3): Sponsorship? Costs about $1K to put on. Arts committee has moved away from this event (artists booths were not seeing much revenue); Recreation committee also not participating. City still supports. Transition Albany has committed $250. Ken McKroskey proposed financial support by AS&R ($250-$500). The festival organizers include Tom Cooper (Sustainability Committee) leading, Dan Lieberman, Alexa (TA), Paul Rooney, and Ken. Last year, also Peter Goodman & Peggy McQuaid. Peter Goodman may be going to other festival (Albany Community Foundation, in coalition w/ school district is doing another festival). If AS&R sponsors, we get logo on poster. Harry asked: how does our participation help our mission; Preston, Amy, Sylvia: lots of visibility and awareness, builds membership, bike parking (community service), bike tuneup (hookup), and opportunity to distribute bike-safety product giveaways and sales (lights, clings); Harry: double-donation? ($$ and service?). Decision: $250 as sponsorship. 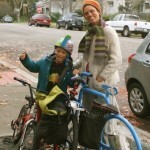 Amy will seek additional sponsor for the bike parking (Bua Luang?). That sponsor could either be to AS&R or directly to A&G. If SLC does bike tune-ups, then SLC logo will go on poster. Peter Maass reports he could approach Rock-the-Bike folks, however Ken says the entertainment slate is pretty full (school music/performance groups). existing 100% plan has some errors, Ken has pointed out; Jeff Bond is suggested that T&S have more active role in reviewing/approving design/construction plans affecting traffic. Ken sez this project was being approved during the time; 2/3 contingency money to be used for change order at Buchanan/San Pablo. T&S mtg, this Thursday (this is “for info only” but people can comment). Preston took a casual poll on 55% vs 2/3 vote proposal for transportation tax. Meeting adjourned at 6:30-ish p.m.